M-Audio's Venom synth was released in 2011. Pro Tools manufacturer Avid has announced that it's selling M-Audio, the music technology hardware and software company that it acquired in 2004. It's being sold to inMusic, the parent company of (among others) Akai Professional, Alesis and Numark. 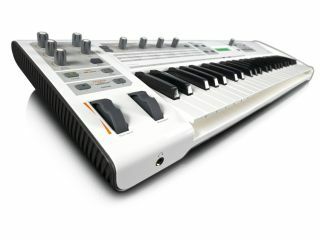 M-Audio has released a wide range of MIDI controllers, audio interfaces and DJ products over the years… and so have Akai, Numark and Alesis. As such, it'll be interesting to see how the brands co-exist in the future. Commenting on the decision, which comes as part of a wider restructure that also sees the company's consumer video editing line being sold to Corel Corporation, Avid says that it wants to "focus the company on its Media Enterprise and Post & Professional customers and to drive improved operating performance." Avid will continue to produce its Pro Tools range and Mbox interfaces. For all the details, check out the press below. Today Avid initiated a series of strategic actions to focus the company on its Media Enterprise and Post & Professional customers and to drive improved operating performance. As part of these actions, the company is divesting its consumer businesses. With these changes, Avid will concentrate on core markets where its deep domain expertise, track record of technical innovation, and strong brand offer the greatest opportunity for success. "The changes we are announcing today make Avid a more focused and agile company," said Gary Greenfield, CEO of Avid. "By streamlining and simplifying operations, we expect to deliver improved financial performance and partner more closely with our enterprise and professional customers. Our objective remains to provide these customers with the innovative solutions that allow them to create the most listened to, most watched and most loved media in the world. I'm excited about our future prospects." Avid has agreed to sell its consumer audio and video product lines. The company's consumer audio products are being sold to inMusic, the parent company of Akai Professional, Alesis and Numark, among others. Headquartered in Cumberland, Rhode Island, inMusic's brands are best known for producing innovative products for music production, performance and DJing. The products involved in this transaction include M-Audio brand keyboards, controllers, interfaces, speakers and digital DJ equipment and other product lines. Avid will continue to develop and sell its industry-leading Pro Tools® line of software and hardware, as well as associated I/O devices including Mbox and Fast Track. Separately, the company's consumer video editing line is being sold to Corel Corporation, a consumer software company headquartered in Ottawa, Canada. The products involved in this transaction include Avid Studio, Pinnacle Studio, and the Avid Studio App for the Apple iPad®, as well as other legacy video capture products. The divested product lines contributed approximately $91 million of Avid's 2011 revenue of $677 million. As part of the transactions, certain employees of Avid will transfer to each acquiring company. Avid estimates that the proceeds from these transactions will be approximately $17 million, subject to closing inventory adjustment, with a portion held in escrow. Both transactions are expected to close today, July 2, 2012. The company's cash balance on March 31, 2012 was $49.7 million. The proceeds from the sale of these product lines should offset most of the restructuring charges paid in 2012.